There are some new folks moving into the neighborhood, finally! Construction was finished 2 winters ago, and the condo sat vacant for a whole year before some brave souls decided to take the plunge into real estate ownership. I’m so glad to have them: very hard workers, keep their yards tidy, and they’re nice and quiet neighbors that don’t bite. Who could this bee? Mason bees of course! I was taking out the compost the other day, and noticed that a dozen or so of the bee holes i drilled out of a cedar block last year were filled in with mud. I checked the bamboo house i also made, but saw no activity there. I’m not sure the difference, but it could be the fact that the cedar house is right next to our apple trees and blueberry bushes- both of which were covered in flowers this year. 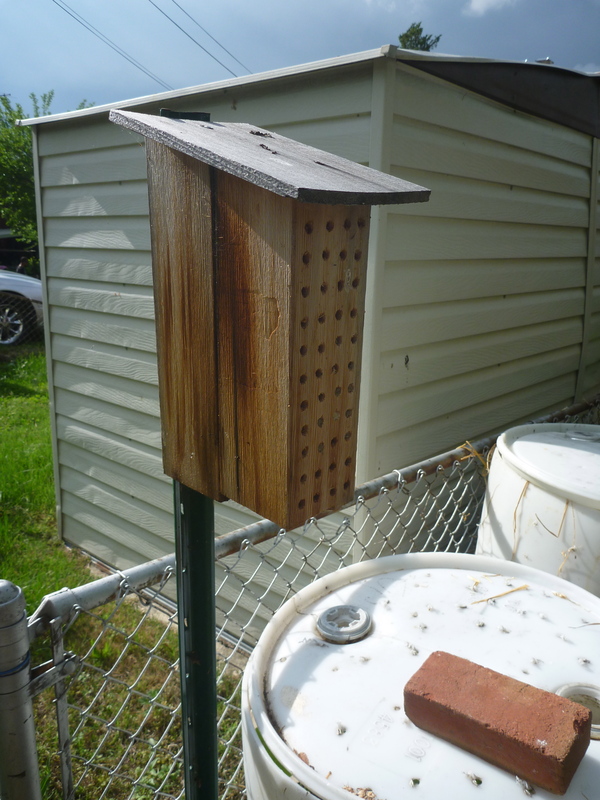 Here’s a link to the post i put up about mason bees, their important role in pollination, and how to provide a home for them. I have no idea who many eggs were laid into each hole, but they’re about 6 inches deep, so maybe 7 or 8 per hole. I’m just so excited that it really worked: and it was so simple too! 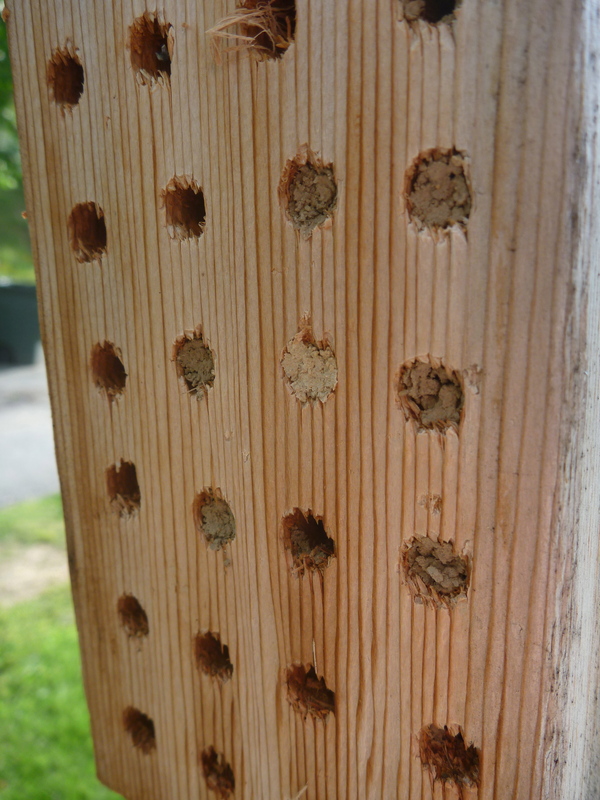 Literally 10 minutes of work: drill a bunch of holes into wood, attach to a post in the garden. 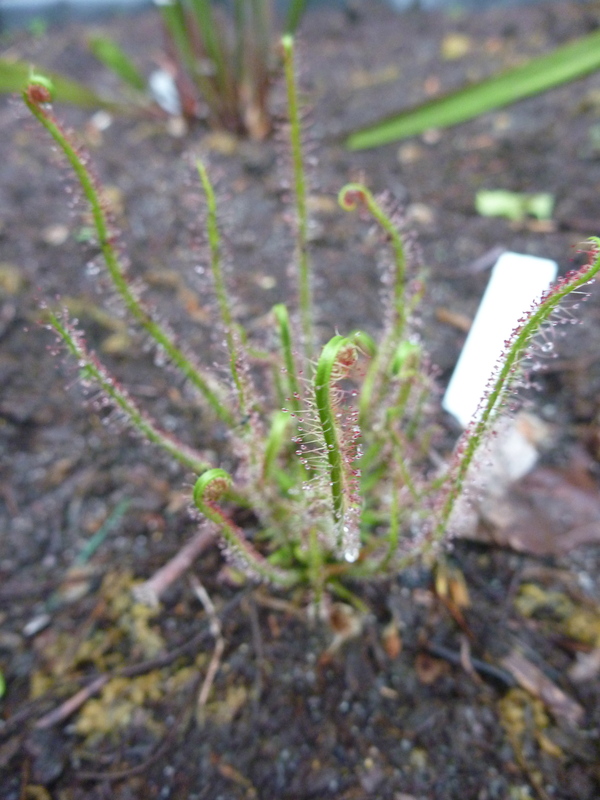 Some other shots of interesting garden goings on: the bog/carnivorous garden is in full swing. The one on the left are the amazingly strange pitcher plant flowers, and the photo on the right is of one of my sundews. 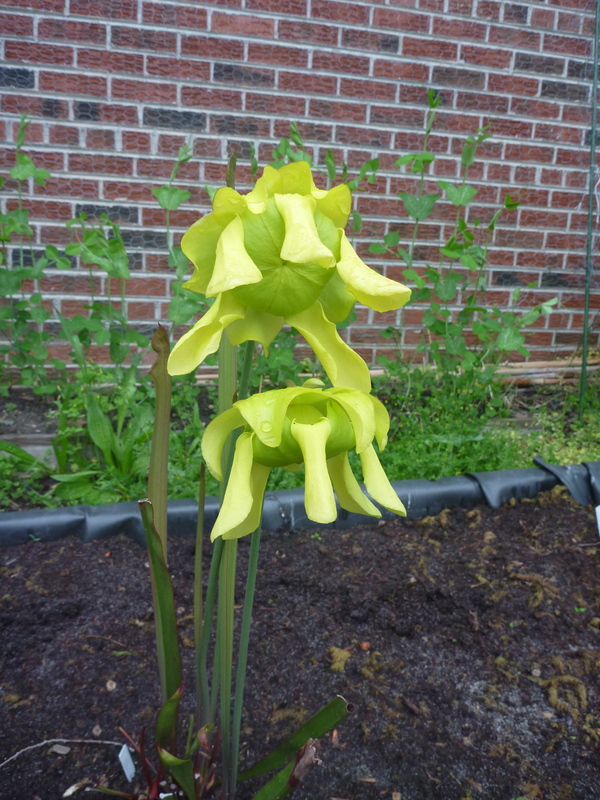 Not to fear: pitcher plants give off a bit of a stink to attract flies and mosquitoes, so mason bees aren’t attracted to them and won’t be eaten. I have returned from my winter hibernation, or should i say cybernation? I know, that was a pretty bad pun, but a wonderful way to start off the blogging season! The first (sort of, i’ve been doing lots of other gardening chores already) order of business was to dig up the strawberry bed. There is an elm tree about 10 feet from two of the back yard’s raised beds which have infiltrated the vegetable beds. I knew that this would be an issue, but i didn’t expect it to happen so quickly (in two years!). As you can see to the left, the elm has thoroughly enjoyed my efforts to improve the soil in my yard: i first suspected this when last year’s tomatoes barely grew only 4 feet and produced a quarter of what they did the season before. 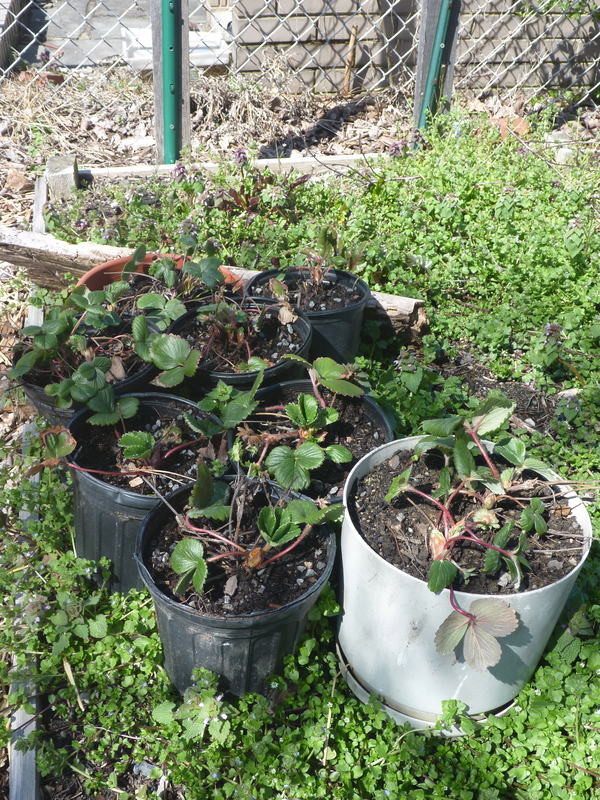 Luckily, strawberries have compact, fibrous root systems, as you can see on the right, making them perfect candidates for life in a container. 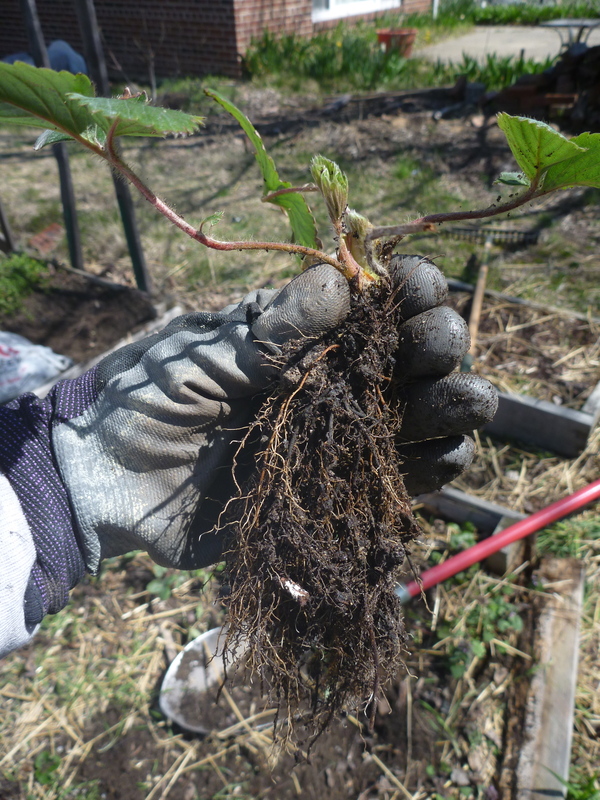 One by one, i dug under each strawberry crown and pulled it free from the tangle of tree roots. I mixed some light potting soil with the raised bed soil to try to get the best of both types: the well drained potting soil with the high organic content of the raised beds. 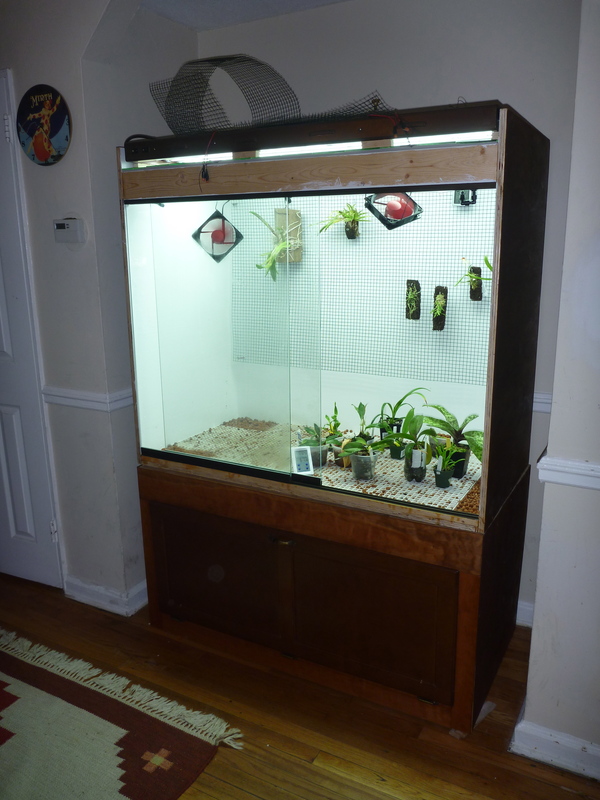 A little orchid case- ok, not so little…i’ll get some more shots of that as i move some plants in and hopefully they’ll be happy in their new humid (80%!) home and bloom. 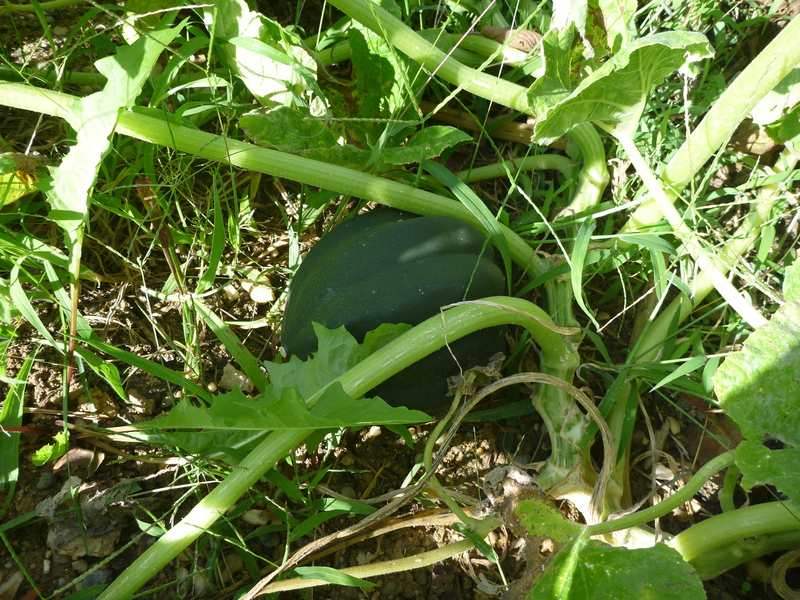 As far as the winter squash is concerned, that was a total surprise. 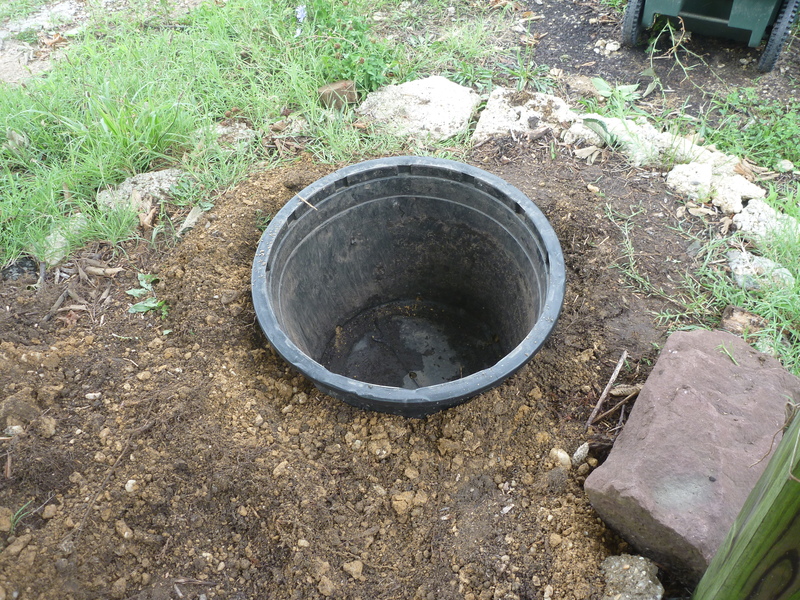 Earlier this summer, i planted a 5 gallon bucket with some holes drilled in it for drainage. 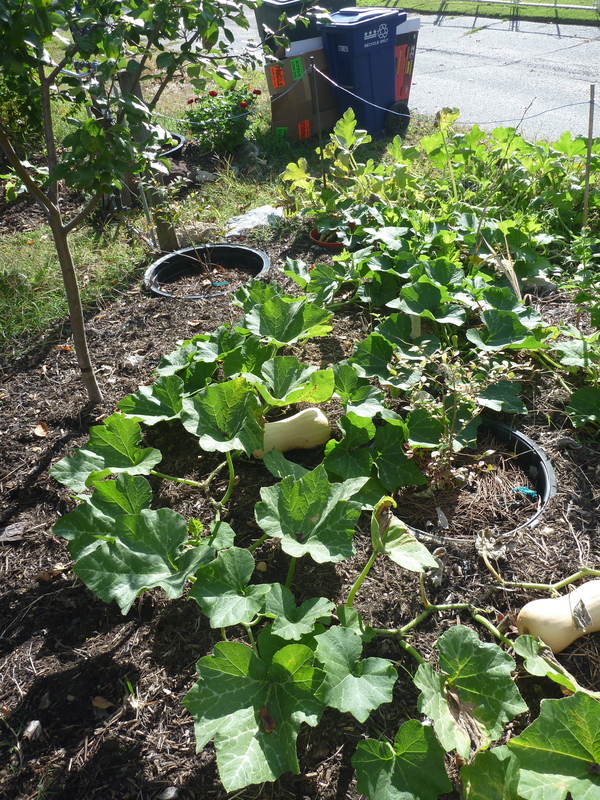 talk about cutting edge alchemy- plant a plastic bucket, get squash! that’s no cucumber! turns out there was plenty of volunteers from last years compost! i planted 6 cucumber seeds, and literally 40 plants sprouted. I had no idea which was which, so i chose 4 and thinned out the rest. As you can see, the plants are plenty happy: over 25 feet long! Ended up with butternut and acorn squash. not quite ready for harvest yet- i’m going by the hardness of the skin and color of the stalk (should be brown and hard). I really like the buried container method- the blueberries (the large black pots) and their specialized acdic soil have really taken off- already doubled in size in 2 months after transplanting. i can plant things a lot closer together, especially around the fruit trees, and still get healthy plants and a good crop. Not to mention not having my yard filled with exposed pots that get overheated in the DC summer sun. Crazy to think that’s it’s nearly the end of august already! I noticed the other day that the bed closest to the house in the front (north) yard is beginning to get some shade as the sun’s angle decreases. sad as it is to lose gardening light, i do love the fall! 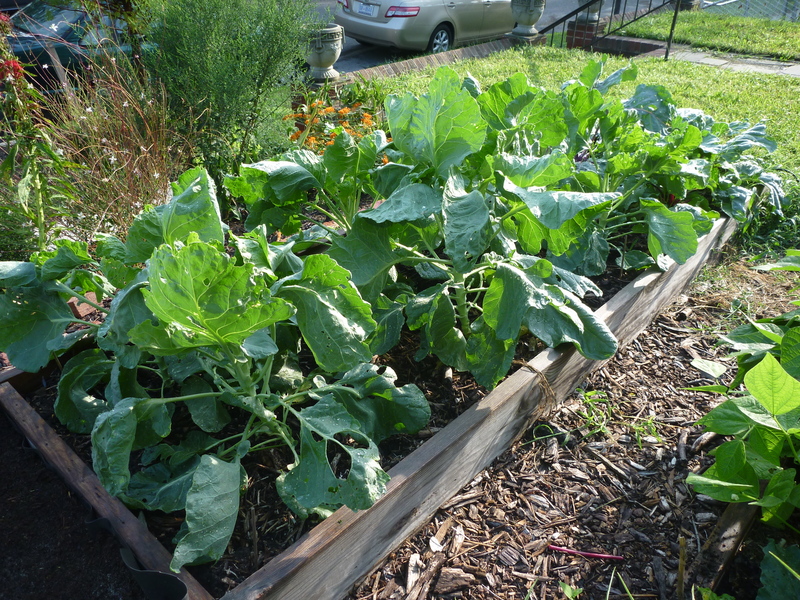 Here are this year’s brussel sprouts, and they’re off to a much better start than last year. Hopefully, i timed it right this go around! last year was a miserable failure: i planted them in the spring, so they set sprouts in august which all opened up and wilted. oops! i sprouted the seeds under lights in the basement this year on june 1st, and transplanted them after the garlic harvest in mid july. i was sure to harden them off to full sun over a few weeks so they wouldn’t get scorched by the summer sun and heat. so far, so good- about 2 feet tall and growing like mad! i’m being a good boy and am keeping on top of the white fly, and especially the caterpillars. obviously i missed a few as you can see by the holes! 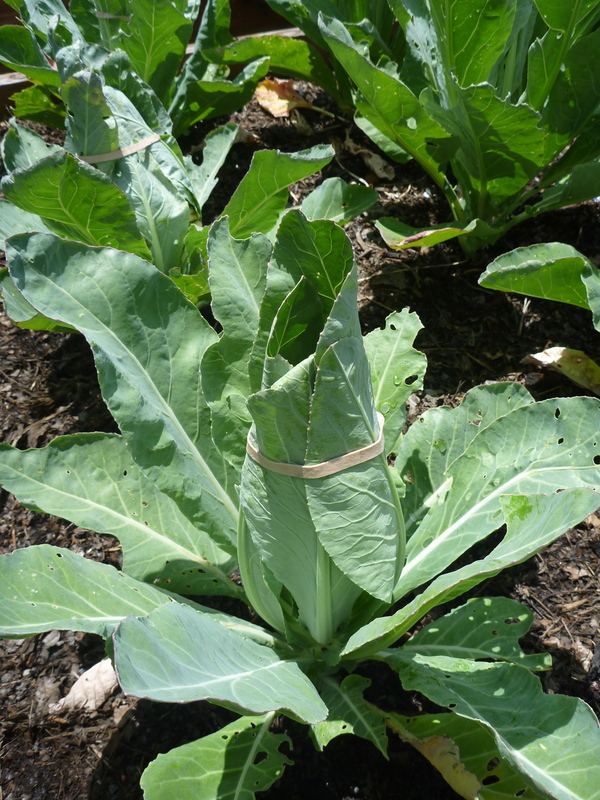 I also transplanted some other fall crops near the same time as the brussels: cabbages, fennel, beets, rutabagas, broccoli, collards, and kale. now that it’s actually raining, things have truly taken off. here’s a shot of the front yard from last week. I know, terrible pun, but i couldn’t resist the temptation. Finally! 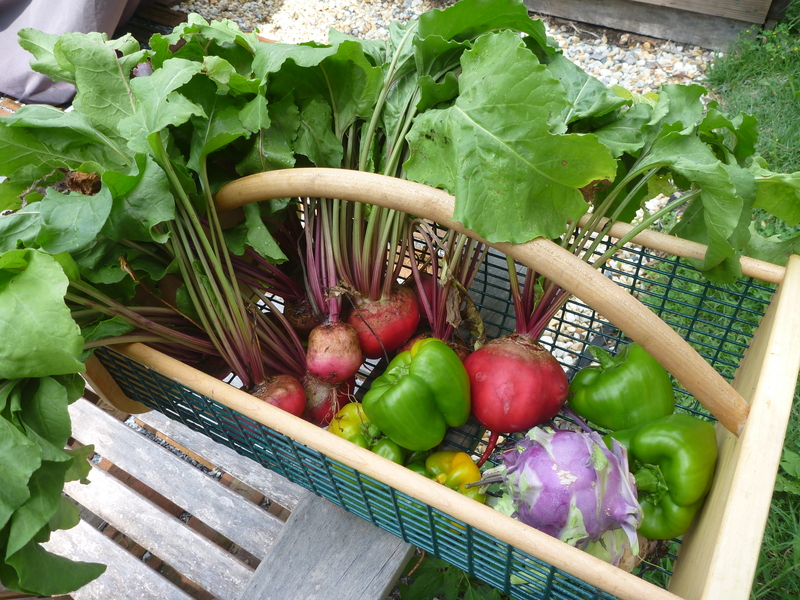 An actual beet harvest. I love beets- roasted with goat cheese and balsamic vinegar; cold beet and yogurt with lemon; grilled with olive oil. And, the beet tops? forget about it! Those are sauteed up right after picking them- butter, garlic and a little bit of red wine. Talk about delicious. 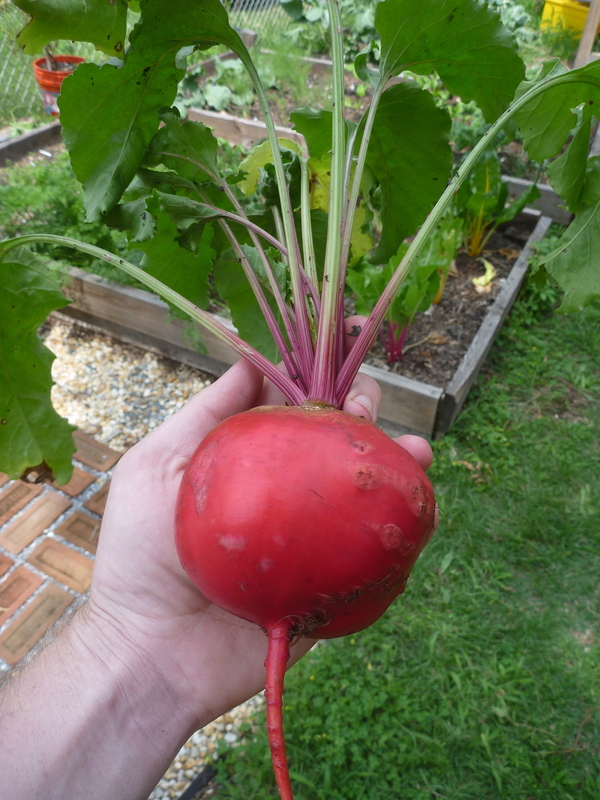 For years, i’ve been struggling to grow beets in DC. Between the sumer heat, and futile efforts to keep the soil moist evenly enough when first sewn. I find that they either don’t germinate at all, or if they do, they stall out for weeks and never amount to much. 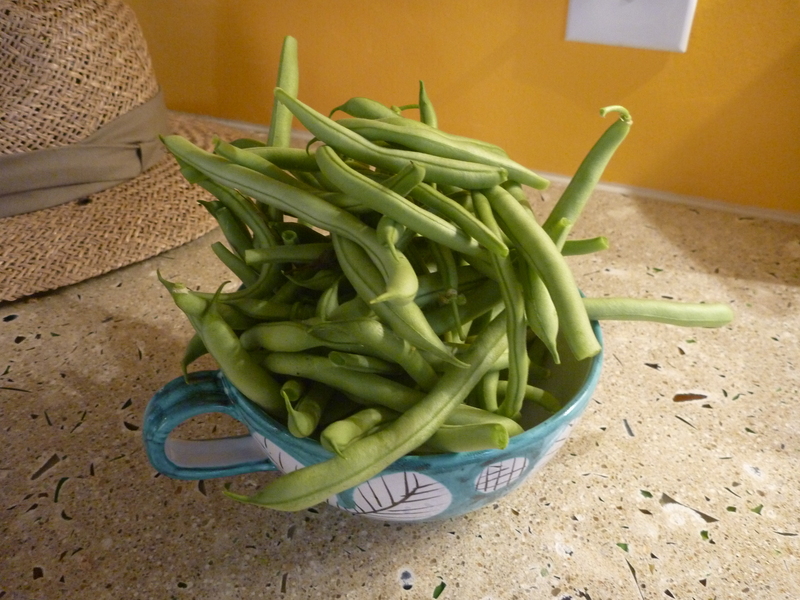 Until….i started sprouting them inside, under lights, and transplanting them 5 weeks later. I went from maybe 20% success, to 90% success. Plus, the quality went way up! Especially with the Chioggia, or candy stripe, beets. These have a lighter flavor and texture, and are a little bit less sweet then the deep red ones. Yum! I think part of the trick is to grow them in small starter pots- i use the 3×3 cells- as i’ve had the best success with these. Be sure to harden them off to full sun really well, as you’re transplanting them during the heat of the summer. I’ve got the poor soil blueberry blues! Well, i think it’s two problems: 1: soil acidity and 2: too much root competition. 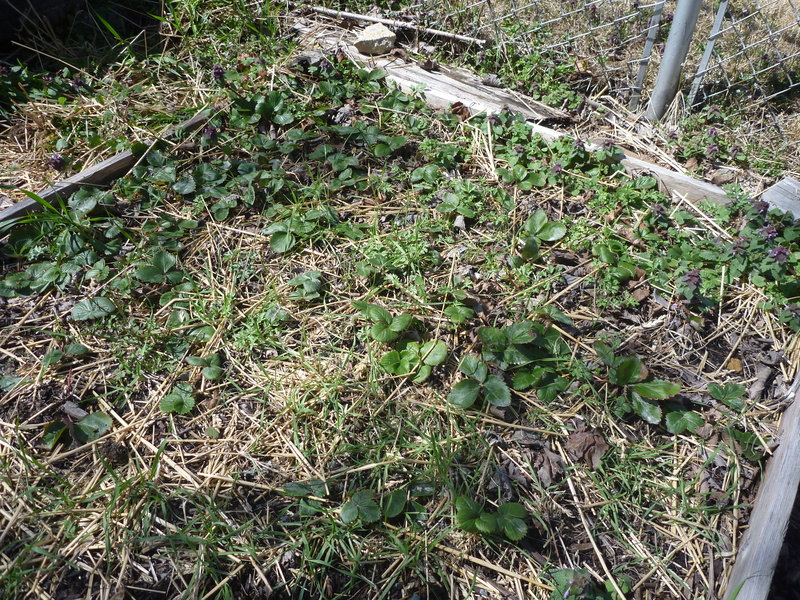 The 4 blueberry bushes that i planted last year have not done a single thing! literally, they just sat there for the past year, none of them put on a single sprout of new growth. So much for creating a natural fence, let alone producing fruit. I borrowed a pH tester for the soil, and found that, despite my efforts of amending the soil with pine needles and sulfur fertilizer (which takes a year to be effective), the pH was still 7.0. Blueberries prefer 4.5-5. Oops. You can see the plant in the foreground, and what i ended up doing in the background. HUGE pots! 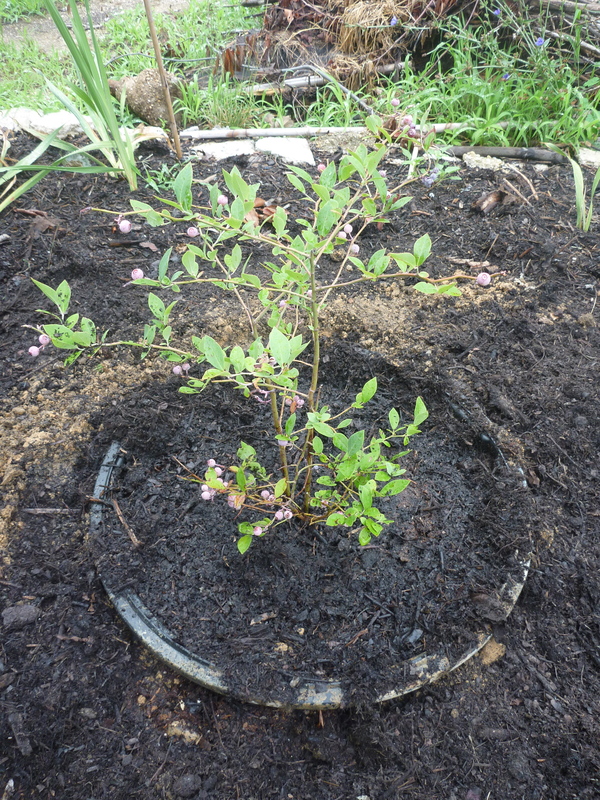 The great thing about blueberries is their shallow root system which makes them perfect candidates for container growing. That, and their need for special soil conditions, pots should help cure my blues. Because i have a small yard, i’m planting things a bit close. 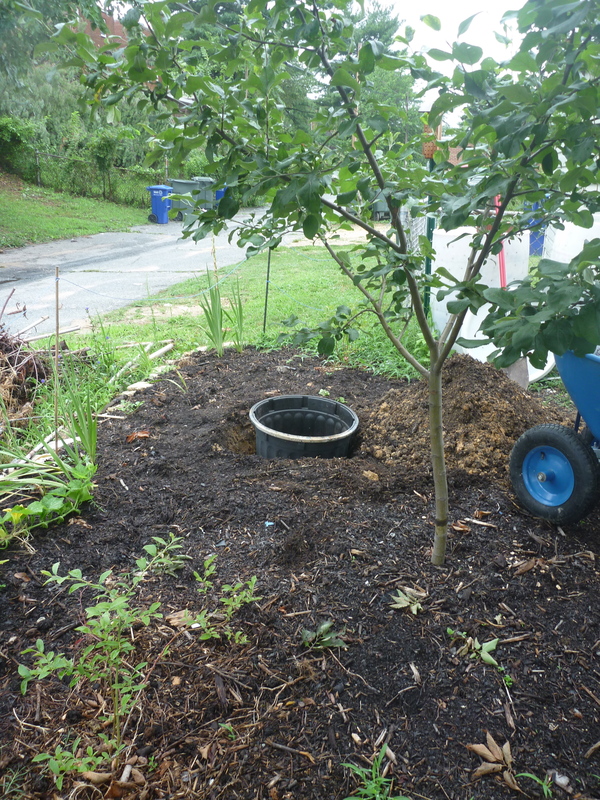 When i dug up the first bush, i saw some serious root encroachment from the nearby apple trees, and the blueberries were certainly loosing that battle. The container should provide a physical barrier against that. I found some 12 and 15 gallon containers and started digging to sink them into the ground. this will prevent the roots from overheating and drying out as a container can really heat up if exposed to direct sunlight. 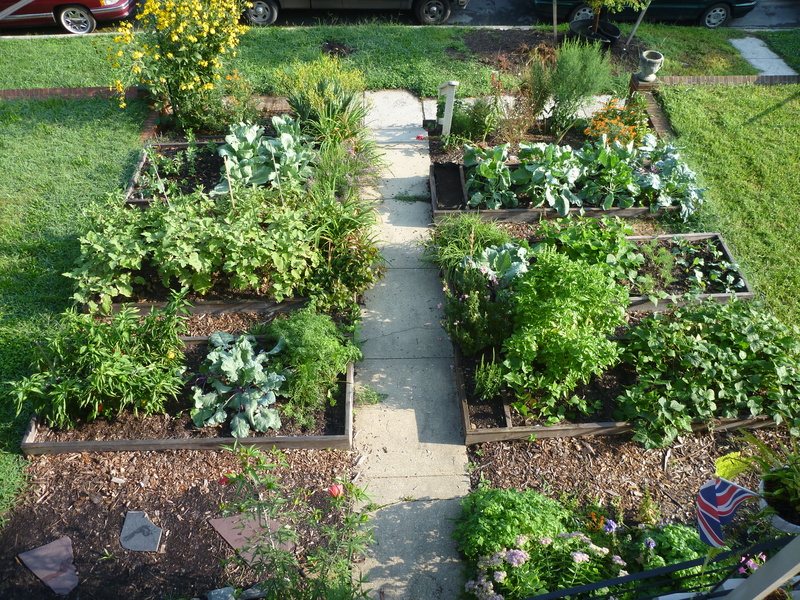 it will also be easier to get around the garden and look better to boot. For the soil mix, i did some googling, and decided on using 50% peat and 50% compost. I had some left over peat from putting in my bog garden (more on that later), and good old Ziggy the Bunny has been cranking out some really good “product” these days. hopefully his hard work will pay off! the peat provides acidity and moisture retention, the compost (we use aspen shavings for Ziggy’s bedding) provides nutrients and a bit more acid. I mulched each container with 2 inches of pine needles, donated from the local patch of woods, again to help keep the acidity nice and low. a grower who did a similar mix in 12 gallon pots harvested 10-15 pounds of each bush! I’ll be happy with 5 pounds…grow like the wind little bushes! Remember how i was saying that we’re actually having a spring- well, now, we’re actually having a summer! i know you’ve heard of the record breaking heat, so i won’t whine (too much) about it. The good news is that some of the plants are thriving in this obscene amount of warmth. Both my eggplants and peppers have taken off in the last few weeks, and i’m very pleased with this japanese long eggplant variety. 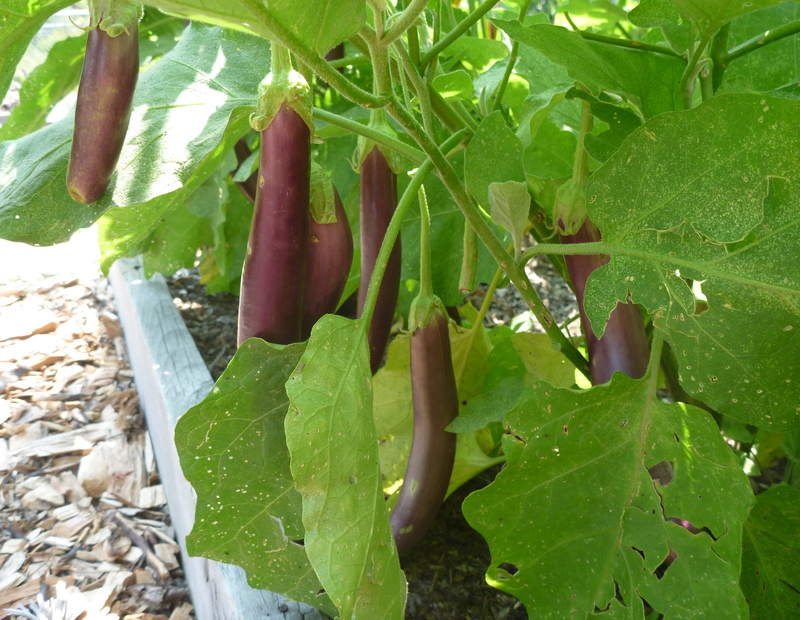 Unlike the black beauty eggplant, these skinnier ones become mature faster, and because they’re smaller, you’re not obliged to eat nothing but huge eggplants all week. Fast cookers, with thin skins, they turn creamy on the grill in only a few minutes! As you can see in the first photo, i’m having some bug issues- we haven’t had a good steady rain in some time. This allows those tiny pests to build up. Between the flea beetles putting big holes in the leaves, and the spider mites sucking away the rest of the juices, i’ve got some stressed plants. 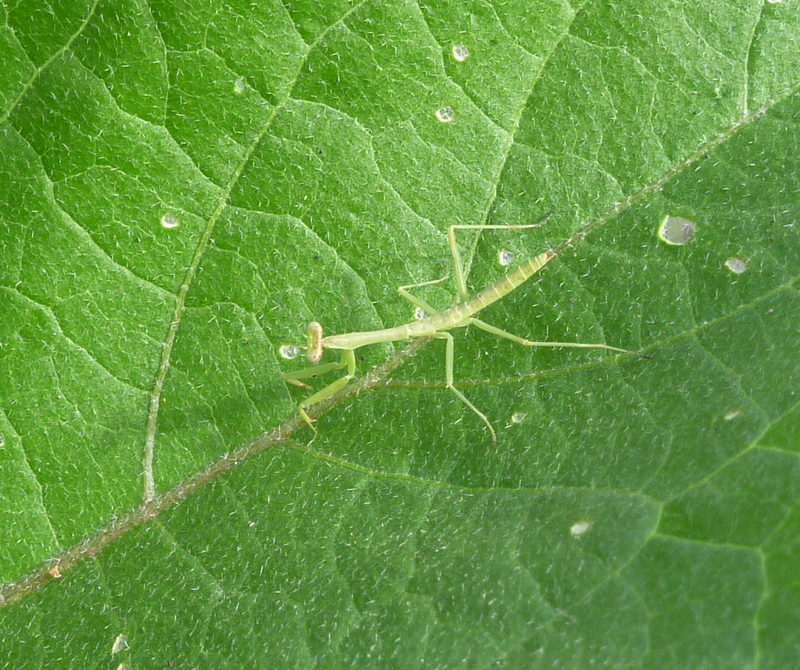 I’ve been reading that the best way to control spider mites is to spray them with the hose- this not only knocks them off the leaves, but breaks up their webs, which allows predators (like this baby mantis) better access to eat them! Yum. Going back to the theme of having an actual spring here in DC, the cauliflower is starting to form heads. the usual DC “spring” lasts about 2 weeks before the temperatures rocket into the 90’s, with night only getting down to the mid 70’s. This year is different- it’s mid june, 75 degrees today and going to get into the mid 50’s tonight! 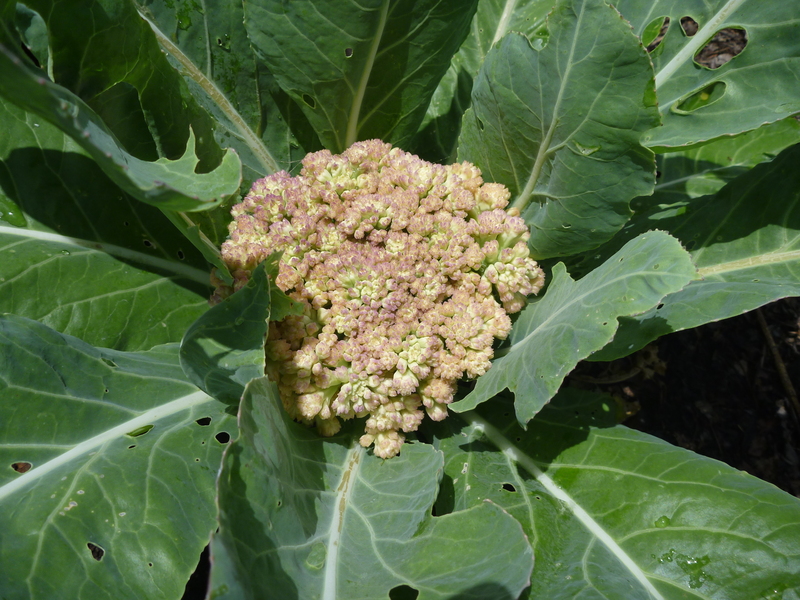 This is my first go at growing cauliflower, and i knew it would be touch and go trying to get an early summer crop in as it’s typically a cool grower. So far, it’s working, certainly not the best, but they’re beginning to ripen. What i didn’t know is that you need to protect the head from direct sunlight in order to keep it white and tight. direct sun tends to make the head brown and yellow, and the florets spread out. the texture also gets grainy if too much sun hits the forming head. 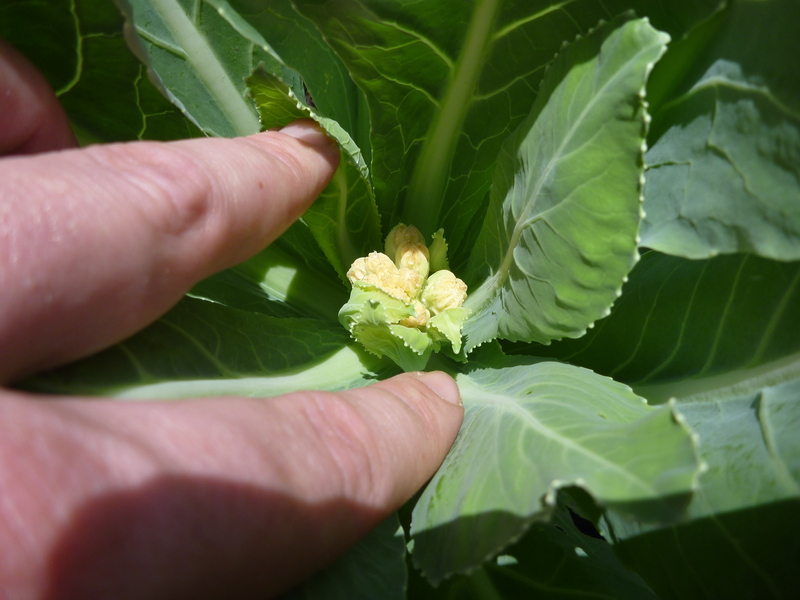 What growers do is called ‘blanching’ or folding the leaves over the forming head, starting when it’s very small (like the photo to the right). i’ve read about different ways to do this- breaking a few larger leaves, using string or clothespins- i ended up using rubber bands. I’m staring to get some white flies laying eggs on the underside of my leafy crops- cabbage, kale and cauliflower, so i’ll have to get the neam oil spray out soon to stay on top of that before it get out of hand. I noticed the other day that some of my softneck garlic was starting to yellow and lean over a lot. I had a pang of fear that i was loosing my garlic, again! last year’s garlic crop, everything but 8 heads out of 100, completely failed having been taken over by fungus. I’m pretty sure it was from some bad seed that i planted, as it only affected one variety. Having bought certified seed last year, and planting them in a different bed solved that problem (for now). There are many ways to know when garlic is ready, depending on the variety. My softneck garlic (Chet’s Italian Red), was certainly ready. Softnecks let you know it’s harvest time when they begin to bend over at their base, much like onions. 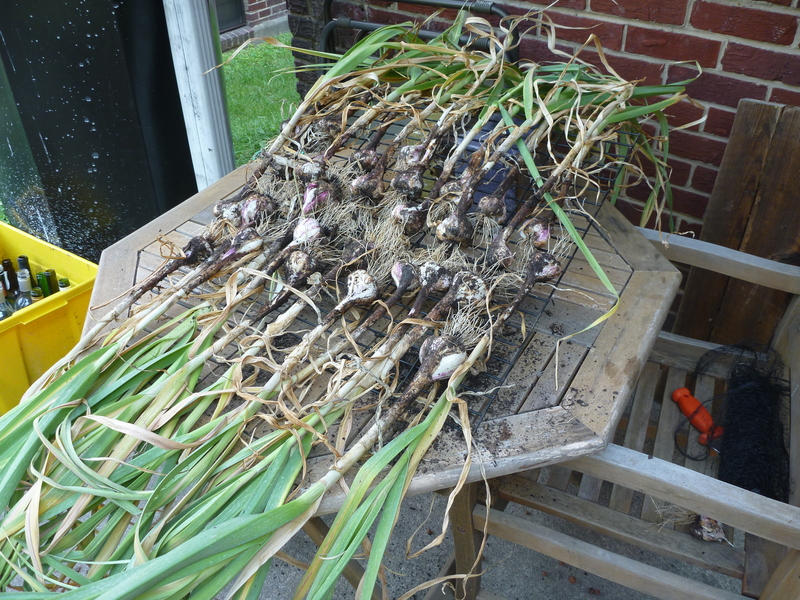 I dug up a few plants to check the bulbs, and they were large and had well-developed cloves and skins. If you harvest too soon, you won’t see the individual cloves. Harvest too late, and the cloves begin to break apart from the plant, getting lost in the soil and not storing as well. 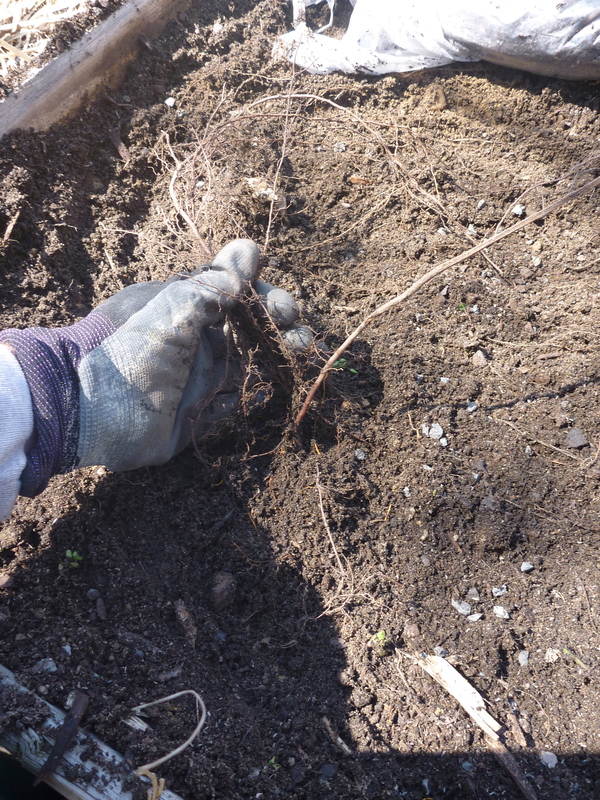 Be sure to use a tool (a garden knife or fork work well) to get under the head and break the roots free from the soil. Soft necks are especially prone to ripping off, leaving the head of garlic in the ground. 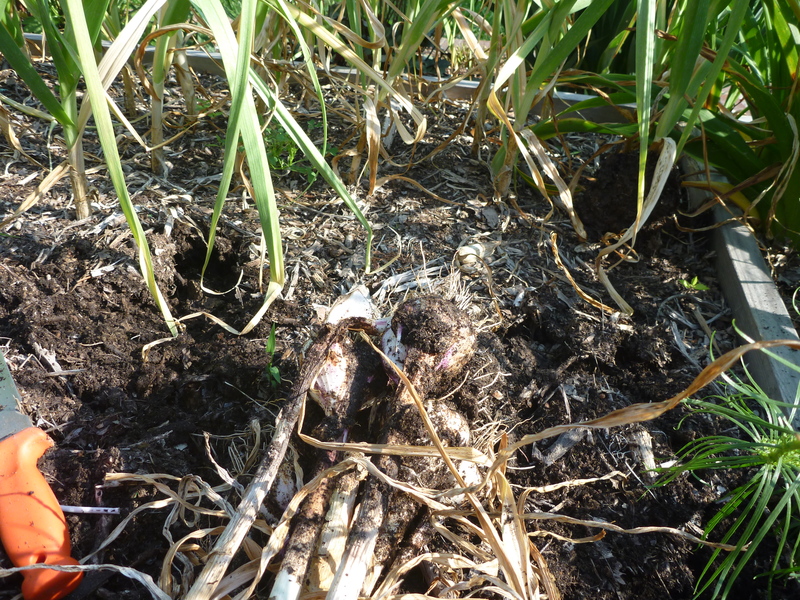 Careful not to damage the garlic, gently lift if up and clear the roots of any loose soil. Lay the plants out on a rack in the shade for a few days, giving them plenty of air circulation to dry out. once they’re dry, i brush off any remaining dirt, and bring them into the basement to finish curing. allowing the garlic to cure for 2 weeks helps develop their skins, so they will store for longer periods, as well as their distinct flavor (chet’s reds are mild flavored and great roasters). once cured, cut off the roots and stems, and store them in a dry, cool spot with decent air movement (i put mine in a mesh bag in the basement). 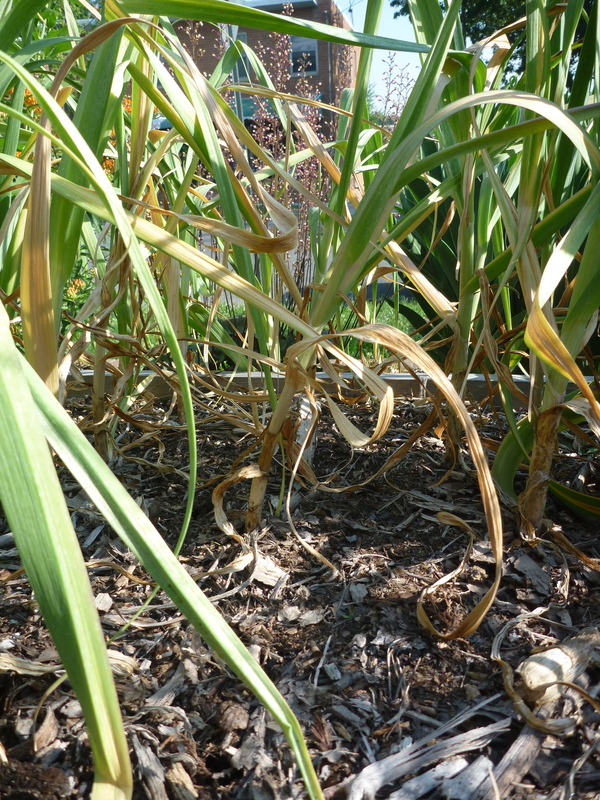 Hardneck varieties (the ones that produce scapes or flower stalks), should not be harvested until 1/2 to 2/3 of the leaves have died back. remember to cut the scapes once they are about 8-10 inches long- i like to sauté them in olive oil- they’re delicious! I have about 50 of those, which are probably still a few weeks away from harvest. Remember to harvest when the plants are ready, and not based on a date, as each variety ripens differently and the growing seasons vary widely from year to year. when they first start to ripen, you should cut back on watering, usually a couple of weeks before picking. with such a warm winter and spring, i wasn’t expecting to harvest for another 2-3 weeks, but i’m ok with that since it means i get roasted garlic on the grill 2-3 weeks sooner!